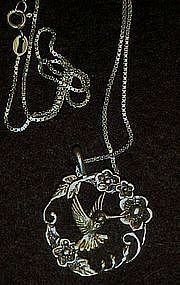 Beautiful hummingbird necklace is about the size of a quarter, measuring about 1" in diameter. Delicate sterling chain is square mesh links. Chain is17" long. Excellent condition! A beautiful ensemble. Both pieces are marked Sterling. Would make a lovely gift for the bird lover.